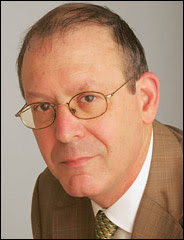 the nytpicker: You Could Say That Too Many Clyde Haberman Columns Begin With Henry Hale Bliss. You Could Say That Too Many Clyde Haberman Columns Begin With Henry Hale Bliss. This morning's column by Clyde Haberman about the dangers of New York traffic began with an example torn from the pages of history. Or, to be more precise, torn from two previous Clyde Haberman columns since 1999 that began precisely the same way -- with the example of the 1899 traffic death of an ordinary, elderly New York pedestrian named Henry Hale Bliss. In all three columns, Haberman leads off with Bliss's example, and with the same precise phrasing to introduce him. You might say that Henry Hale Bliss was done in by his own chivalry. As this old story goes, he had stepped off a trolley car at Central Park West and 74th Street and was turning to help a certain Miss Lee also get down when he was run over by an automobile. Miss Lee became hysterical, and for good reason. Mr. Bliss's skull and chest were crushed. A few hours later, he was dead. Had all this happened in today's New York, Mr. Bliss might have lived. He probably would have kept walking and avoided the auto. How many men today extend a hand to a woman getting off a bus? For that matter, how many women welcome the assistance, rather than telling the guy to keep his bleeping hands to himself? But New York and the car were simply not made for each other. You could say the relationship began to go sour as early as 1899. That was when a luckless soul named Henry Hale Bliss stepped off a trolley car at Central Park West and 74th Street, turned to help a woman climb down and, for his troubles, was run over by an automobile. To be more precise, by (what else?) a taxicab. Chivalry might not have been dead in 1899, but Mr. Bliss was. He became, it is believed, the first person in America to be killed by a motor vehicle. A "historic site" sign on a lamppost at 74th and C.P.W. gives Mr. Bliss an even greater distinction. It calls him the first auto fatality in the entire Western Hemisphere. How's that for New York trend-setting? You could say that it started with Henry Hale Bliss in 1899. On a September day in that twilight of the 19th century, Mr. Bliss got off a trolley car at 74th Street and Eighth Avenue, now Central Park West. He turned to help a Miss Lee step down. That chivalrous act — not often seen these days, and not only because we no longer have trolleys — cost him his life. It put him in the path of a swerving automobile (a taxicab, you may not be shocked to learn). Thus did Mr. Bliss enter the history books. He is believed to be the first person in the United States, indeed in the Western Hemisphere, to be killed by a motor vehicle. But he bore another distinction. He was 68, possibly 69. That made him also the first American of what is sometimes coyly, and irritatingly, referred to as a certain age to die in this manner. You could also say say how irritating it is to see Clyde Haberman drag Henry Hale Bliss out of the drawer every time he's looking for a lede for yet another column about traffic.